Set of two Lambda chairs by Richard Sapper and Marco Zanuso for Gavina. Extreme Industrial-Design research for this piece generated by two steel sheets joined together. Incredibly compact and comfortable seat. 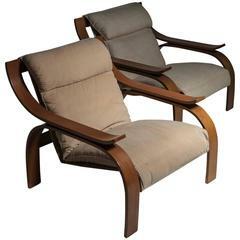 Remarkable set of two woodline lounge chairs by Marco Zanuso for Arflex. Plywood frame and canvas upholstery. The chairs have a slight different colors, please ask for more pictures. 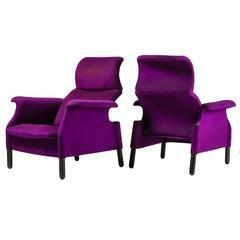 Remarkable set of two "Sanluca" lounge chairs by Achille and Pier Giacomo Castiglioni for Gavina. Fully original "Sleep-o-Matic" sofa by Marco Zanuso for Arflex. 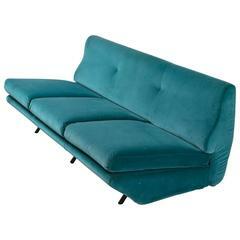 Evergreen shape and comfortable masterpiece of Italian 1950s design. Pair of table chairs with metal frame and leather details. Designer Marco Zanuso Manufacturer Zanotta 1970s. Handsome Marco Zanuso attributed club chair with signature curved lines, brass legs and reupholstered in black seat and backs with contrasting white linen arms. Lacquered steel with leather. Measures: H 83 cm/ 2' 8 2/3" W 38 cm/ 14 15/16" D 44 cm/ 17 1/3" SH 46 cm/ 18 1/8". Great pair of Italian midcentury chairs with brass legs in the style of Marco Zanuso. Newly reupholstered in a Romo cotton velvet.